This February kit is FANTASTIC and I love all the blog posts this week from the design team showing off its versatility! One thing I love to do in most, if not all my layouts, is to show dimension. Whether it be with alpha stickers and embellishments or simply using patterned papers with cute shapes. I took the hearts from the Fancy Pants collection, cut them out and used my very favorite foam square adhesive for added texture. Be on the look out for information regarding our 2nd Online Crop…the “SWEET CROP.” It will be full of lots of games, challenges and prizes! We have a great theme and should be a lot of fun! Only a few days till the the February kit is ready for purchase! Mark your calendars! It is a perfect Valentine’s gift to give yourself!!!! Jennie, Diana and I just returned from a fabulous trip to Anaheim where we attended CHA and got to check out all of the new and exciting scrapbook products. We spent long days and late nights checking out all of the beautiful scrapbook goodies and then put them into our next several kits for you. Here’s a look at what we got to enjoy while at the show. I thought I was taking so many pictures, but I missed so many great photos. Diana also took pics and I’ve included a couple of her pictures too. Pink Paislee. Love the booth and really liked all of the product samples. Cosmo Cricket. The Girl Friday and Snorkel lines were favorites! We found a fun new company named Jillibean Soup. Finding companies like this is one of the great reasons we like to go to CHA. Heidi Swapp has a cool new invisibles product. It comes in 12 X 12 paper sheets and an alpha. It’s an embossed product with a resist coating that you can ink and paint and the color won’t stick to the embossed texture. Very cool! Here are Heidi’s samples of what to do with the product. Pebbles Inc. had some really great new product. We were pleasantly surprised. Fancy Pants really amazed us. All of their designs were top notch. We stopped by the Unity Stamp booth where the really friendly ladies showed up new stamps and new packaging and we even got to choose a free stamp. Cool! Sassafras also had some great new product. One of our favorites was there adorable felties. We also loved My Mind’s Eye new Penny Lane line. We were feeling the force when we met up with these characters. The entire convention center building was evacuated Monday morning because of a possible small fire. Luckily we were only outside for a few minutes. We wandered a little from the scrapbook section and in desperation for a place to briefly sit and rest our feet Jennie and I ended up sawing some wood. Interesting. We had such a great time scouting out the BEST products for you! Can’t wait to show you what we bought! I’ve been having so much fun with the February Kit from Scrapbook Circle! There are so many awesome embellishments in this month’s kit…some of my favorite being the little decorative paperclips from Making Memories and the small transparencies from Fancy Pants. On this layout I actually stitched three of the transparencies onto my layout over patterned papers…I really love the look! The hearts I actually cut out from one of the beautiful (double-sided) patterned papers from the kit and adhered them to my page using 3 dimensional adhesive. Can’t wait to see what you all come up with using this sweet kit! I needed a card for a friend who had a baby girl last week. 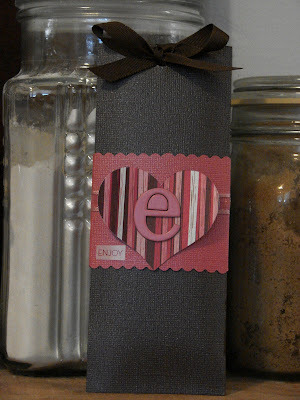 The Feb. kit “Will You Be Mine” had some beautiful papers and embellishments for me to use. I loved using the MM carstock stickers & Doodlebug glitter frills – such a quick way to embellish the card with sweet sentiments and the baby’s first initial! “Happy New Baby” is a Stampin’ Up stamp, but everything else is from the fabulous Feb. kit! Yes, you read right! We here at Scrapbook Circle will be having another SWEET online crop scheduled February 5-7. Stay tuned for more details! But make sure that you mark your calendars because the prizes and game will be fun! We’re so excited to share our February kit, “Will You Be Mine?” with you! There’s so much in it, I thought I’d take a bunch of pictures so you could get a good look at all of the goodness. I just couldn’t resist this Valentine Card paper from Fancy Pants. They could be the cutest valentine’s I’ve ever seen. Do you love this robot as much as I do? Plus you get the full 2 sheets of Making Memories stickers which has both an alpha and lots of words too! Each kit comes with a full Fancy Pants 12 X 12 transparency of little frames. Perfect for layering over photos and creating beautiful journaling spaces. These black alpha is gorgeous. It is covered with a velvet, textured pattern. This gives great dimension and softness. Aren’t these felt paper clips from Making Memories just so fun? We also love these pins. They will make the perfect finishing touch to your cards, projects and layouts. Ahhh…a new adorable Jenni Bowlin bingo card. Plus the red paper on the left is covered in individually white glittered hearts. One can never have enough glitter! The Doodlebug stickers come covered in glitter. All of the work is done for you! Just peel and stick. Are you ready to play?!? Tempt your loved one’s tummies with these tasty treats that say I love you! Valentine’s Day is another reason for me to eat sweets! I have a major sweet tooth:) If you like to make treats for Valentine’s Day-here are some yummy recipes for you. Label each strip of paper to say “A Kiss For You!” Follow directions on cereal box for making treats. Allow the mixture to cool until easy enough to handle. Have children mold it in the funnel. Place on waxed paper to cool completely before wrapping. Wrap kiss and strip in aluminum foil. Give as a gift to a special someone. 1. Thoroughly cream shortening, sugar, and salt. 2. Add egg, molasses, and vinegar. Mix well. 3. Sift together dry ingredients. Add to molasses mixture, mix well. 4. Chill about 3 hours. Roll out, ¹ inch thick, on lightly floured surface. 5. Trace children’s hands onto paper and cut out with scissors. Place paper hands on dough and cut around with a knife. 6. Place on greased cookie sheet and let children decorate their own hands. Use red hots for fingernails, silver balls for rings, etc. Prepare sugar cookies according to directions on the package for rolled cookies. Cut hearts in dough using a cookie cutter. Use knife or smaller cookie cutter to cut out a heart in the center of half the cookies. Place cookies on ungreased cookie sheet. Bake at 350 degrees for 7 – 9 minutes. You can bake the baby hearts, too, for 5 minutes only. Let cool. Spread each big solid cookie with frosting and top with a cutout cookie. Sprinkle with powdered sugar. I am always trying to think of new ways to make my son’s Valentines cute! Not that I don’t like superheros…but something a little more creative and personable. Well, this year I don’t have to think of anything at all! I found this awesome and super easy idea by Candice Stringham in the current issue of Creating Keepsakes. It is as easy as taking a picture of your child, using your favorite punches… Here she used the a scallop and square punch, a little adhesive and your done! You can even have your child get involved by letting them place the picture on the Valentine candy! With just a few weeks away I hope this give you a little inspiration for your Valentines and gets you ready for the February kit from Scrapbook Circle. It looks yummy! Have a great weekend and happy scrappin‘! This was a project that I did for a little Valentine Treat last year and I thought I’d share the “how to” with you all too! It’s really quite simple and super fun…I have a feeling that I’ll be making more this year using the February Kit from Scrapbook Circle as well! Today is historic. Every Inauguration Day is historic. And I felt the urge to scrap a little history today. So I used my son’s Haiku poem, a few of my thoughts & a photo of today’s newspaper. The January kit had just the right subtle patriotic colors, with stars from the November kit and a couple of Unity stamps. If you’d like to read the journaling, you can view it in the Scrapbook Circle Community. Hope you and your family have been able to soak in some of the history today.